Tips to Improve Softball Pitching Mechanics! Home » Softball Drills » Softball Pitching Drills » Tips to Improve Softball Pitching Mechanics! In a previous blog post, we talked about softball pitching mechanics, and the wrist snap, leg drive, drag and closing of the pitch. In today’s blog post, we are going to continue discussing these fundamentals as we explore variations of this pitching mechanics drill set further. Be sure to check out the article 4 Softball Pitching Drills to Improve Mechanics if you have any questions or problems following along with today’s article. In this next pitching mechanics drill, we’re working on the arm swing, the wrist snap, the release, and the finish. But now we’re going to include the legs. We’re using the weighted ball and the purpose of this is actually now to put the legs together with the upper body a little bit more. I’m taking a few steps back so we’re about 30 feet away. And every time I’m doing these pitching mechanics drills, I’m going to draw my T so I have my power line so I know exactly where I want to be and where I want to step. And I think it’s important because a lot of young pitches can get what I all sloppy. And they don’t pay attention to their strides or their legs or their feet or their drag. So make sure you’re always reading the dirt on what you’re doing. So the position we want to get into is have your leg up. And I want to have my arm set into the X position. And now all I’m going to do is really work on driving out towards my catcher, planting, snapping, and releasing. This is a good way to get your legs warmed up. You can also do a different form of this pitching mechanics drill where you can start with your arms forward, come back up on the leg, and stride. You can try whichever one is more comfortable for you. The purpose of this pitching mechanics drill is to work on your leg drive along with working on your arm swing in a progressive manner, while not coming all the way around. So this really helps me to time when my front leg plants and where my arms are at plant. In my opinion, if you’re having problems timing your lower body and your upper body, you want to isolate those two things and really work on that. And this is the best way to do that. Let’s say you’re taking too short of a stride and you’re not letting your arms get through. Well, this way you can really work on trying to take a little bit longer stride. I’m also getting up on my back toe as I’m pushing off. And it also helps with balance – a lot of young kids have problems with balance. I like to introduce it first without a cone and then I will introduce it with the cones. If I have a kid, a young lady who is not taking a long enough stride, this is a perfect opportunity for using the cones. First mark the players stride. And a good way to mark stride is, based on your height – and I’m 5’10”. I like to take about a 6-6½ foot stride. And the way I measure that is I put my heel on the front of the mound and I go heel to toe. One, two, three, four, five, six and a half. And that’s my stride. A young lady who’s quite a bit smaller, obviously her stride will be a little shorter. But you want to make sure that she’s taking further than a 2- or 3-foot stride. That she’s actually getting her legs up and driving them out. And this is one of the major problems I see with kids and what I mostly work on. So if I have a child who I feel like doesn’t really stride very well, I’ll introduce the cone. And I’ll have them place their feet a little bit further than shoulders’ distance apart. And with their arms are forward, they’re going to come back and stride over the cone. This forces them to use their legs and stride a little bit more. But you’ve got to watch out that they don’t try to come around the cone, and if you have that problem then maybe you can set up several cones. You can also do this with a glove or some other object that they can visually see the cone and that will also impede them from stepping on top of it. One thing that’s really crucial while you’re doing this pitching mechanics drill is that you have to pay attention to what the back side of the pitcher is doing. What happens a lot with young pitchers as you’re showing them this drill is they will stride out and then the back side will get stuck. So you have to make sure you tell them to quickly drive the right side through once they’ve stepped out. And this will get everything more explosive, more powerful, and much quicker. The next pitching mechanics drill that we will be doing is bringing the arm all the way around, but keeping the feet stationary. And the purpose of this, as all the drills are, is to progress through the pitching circle and the motion little by little so that we can work on the whole thing and put it together at the end. So what we’re going to be doing is, from the same distance, about 30 feet, which is about three-quarters of the way to the mound, I’m going to spread my feet out, be in a balanced athletic position, and now I’m going to work on my arm circle, making sure it’s tight, making sure I’m rotating open, and making sure I’m long, I’m snapping, I have my release point, and my finish. At this point you can introduce the regular 12″ ball, after you’ve thrown probably 15 or so of the weighted ball or the Cannonball. And what’s going to happen is, especially with your younger kids when they first try this, they’re going to want to aim it and throw it up in the air nice and high. It’s important that you tell them to throw it as hard as they can. Trust their release point and stay nice and long while they’re doing this. Did you find these pitching mechanics tips valuable? Share your additional tips and comments below! And if you are looking for more great pitching mechanics drills, be sure to check out my Softball Drills and Practice Plans series, complete with video demonstrations, for more great drills, tips and techniques you can incorporate into your softball practice plan! And don’t forget to Become a Fan on Facebook, where I will share even more valuable pitching mechanics information. 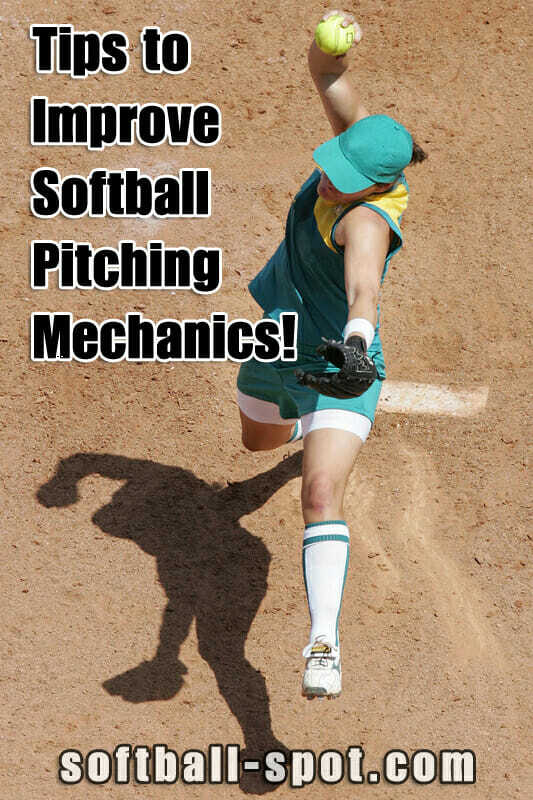 1 Response to "Tips to Improve Softball Pitching Mechanics!" I’ve seen the cone technique work very well on several occasions for poor striding players. Good advice!